Since a principle of the Buddhadharma says that all phenomena are without self and that all living beings which exist within this phenomenal world are also without self, then by definition human beings and their activities are without self. 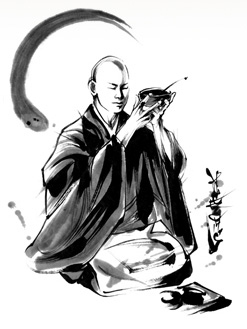 The daily activity of “eating” as well, which is repeated endlessly through the life of a human being, is a manifestation of this truth of “no self.” On one level, we can see that we are given the opportunity to embody the place of “food” which stands face-to-face with the Dharma when we sit zazen. For us who live as monks, this is our good fortune, so we must not neglect this opportunity nor be careless with it. It is a wonderful that Dogen Zenji's intention for practicing with the etiquette for eating is now being practiced throughout the world. For beginners, this way of eating may seem at first to be bothersome. However, as you come to understand that each movement and activity is the Dharma as well as a new existence, you will see that this activity of monks, which everyone can use and apply to their lives, is itself nothing other than the manifestation of the no-self of the Dharma and the no-self of human beings. At that time, each of you will deeply realize that this writing about oryoki is not simply about ceremony and etiquette.